Supermarkets may well have upped their efforts when it comes to food waste and emissions reductions, but many are still not doing enough when it comes to sustainably caught fish, according to new research from the Marine Stewardship Council (MSC). 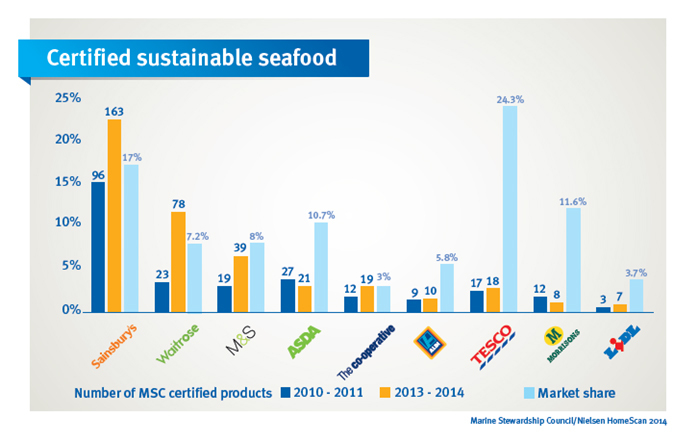 The research, released today (30 January), reveal a growing gap between supermarkets when it comes to offering their customers eco-labelled sustainable seafood choices - despite the availability of MSC-certified fish at an all-time high. In terms of the numbers of products stocked, Sainsbury's is top of the table for the fourth year running, with 163 MSC-certified seafood products on its shelves. This is almost twice its closest competitor, Waitrose, which stocks 79 certified seafood products and more than three times the number of products stocked by Marks & Spencer. At the other end of the spectrum, Tesco has stalled with the number of MSC eco-labelled products on its shelves going from 17 in 2010 to 18 in 2014. Morrison's commitment to certified sustainable seafood has dropped from 12 to 8 and Asda has similarly fallen from 27 to 21 certified sustainable products over the same period. MSC's senior UK country manager Toby Middleton said: "We know that consumers expect sustainable seafood choices in their supermarkets but not all supermarkets are making it easy for their customers. UK shoppers expect sustainability built in to their purchase, regardless of their price point. "Sainsbury's has already shown that price need not be a barrier to sustainability with even their Basics fish fingers MSC certified, at 65p a pack. It's time for the other retailers to step up to the mark." Earlier this year, the MSC published an independent consumer survey which revealed that 71% of UK respondents said they believed that it is important that supermarkets sell sustainably caught seafood. Respondents also said they trusted eco-labels on products (61%); more than recommendations from family/friends (57%), information from supermarkets (48%) and brands' own promises on products (41%). In other areas of sustainability, retailers have shown great improvements over the past few years. The British Retail Consortium's first progrss report, released earlier this week, showed that supermarkets achieved a 13% reduction in absolute carbon emissions between 2005-2014, with a 2020 target of a 25% reduction - a trajectory that goes beyond the UK and EU carbon reduction targets. And on food waste, the UK's seven major supermarkets contributed to just 1.3% of all food waste in 2013; having managed a 10% reduction between 2005 and 2012, accounting for just 200,000 tonnes out of 15 million tonnes.